KIDS CELEBRATE WINTER HOLIDAYS AROUND THE WORLD! 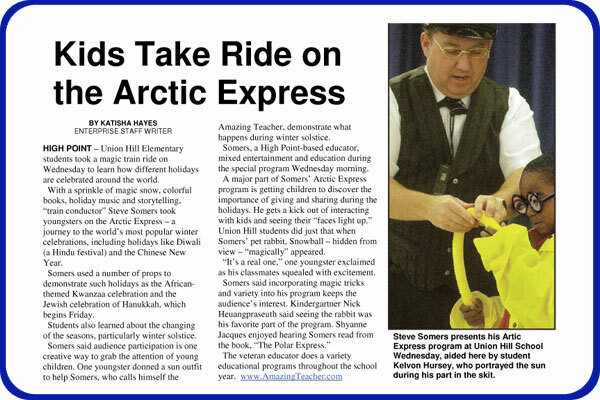 “All Aboard!” Conductor Steve invites students on a magical train ride called the Arctic Express. Passengers will visit and learn about winter holidays around the world. This is a program that is trainloads of fun. At the same time it is an enlightening and encouraging look at the spirit of giving and magic of sharing. As a result of this imaginary trip, qualities of character that both parents and teachers want to see take root and grow in the lives of the boys and girls they love and care for. The Arctic Express explores winter holidays from around the world! Using acclaimed books from the school library and the Arctic Express Reading List, Conductor Steve will introduce the students to these winter celebrations. 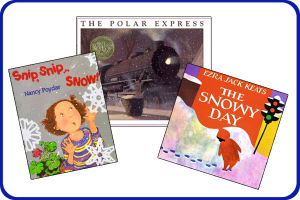 Three of the books are: The Snowy Day, by Jack Ezra Keats, Snip Snip Snow, by Nancy Poydar, and of course, The Polar Express, by Chris Van Allsburg. Within a wonderful mix of interaction and surprising illusions throughout his 45-50 minute presentation, the children and teachers are listening and learning. Steve identifies, defines and discusses with them words and concepts from the Arctic Express Selected Vocabulary List. The words are presented carefully in context and definition so the boys and girls will have good reason to remember them. Teachers may find it useful to include some of the words as bonus vocabulary words, spelling words or words woven into lesson plans in the future. Consider ways to share and give to others who may need our help. 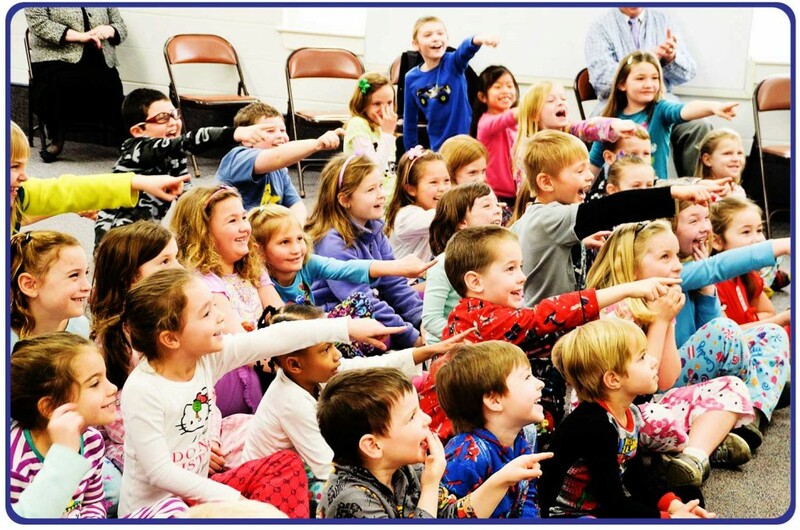 Kids at a PJ party celebrate winter holidays from around the world! This is a spectacular show and a sheer delight for everyone—the boys and girls, the teachers and the staff. The story line effectively captures what Steve Somers is committed to do for your school or library. Most of all, he wants to share his heart and his life with others, again the spirit of giving and the magic of sharing. 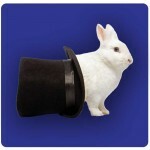 Consequently, when you see a “bunny” appear, the “magic snow” fall, and hear the sleigh bell ring, you won’t be the only one to wipe a tear from your eye. Steve is indeed an amazing teacher and this is a show that children and adults will remember for a long, long time! The perfect program for November, December or January. Take a peek at some video clips from the Arctic Express show. This show is always a popular holiday favorite. Some schools re-book the show each year. One library hosted the show each year for eight years, claiming it as a patron favorite and a classic “tradition”.